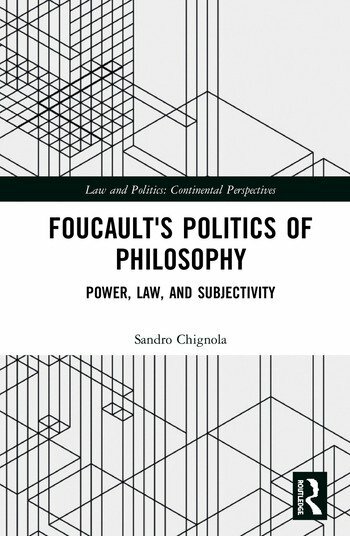 Oriented around the theme of a ‘politics of philosophy’, this book tracks the phases in which Foucault’s genealogy of power, law, and subjectivity was reorganized during the 14 years of his teaching at the College de France, as his focus shifted from sovereignty to governance. This theme, Sandro Chignola argues here, is the key to understanding four features of Foucault’s work over this period. First, it foregrounds its immediate political character. Second, it demonstrates that Foucault’s "Greek trip" also aims at a politics of the subject that is able to face the processes of the governmentalization of power. Third, it makes clear that the idea of the "government of the self" is – drawing on an ethics of intellectual responsibility that is Weberian in origin – an answer to the processes that, within neoliberal governance, produce the subject as an individual (as a consumer, a market agent, an entrepreneur, and so on). Fourth, the theme of a ‘politics of philosophy’ implies that Foucault’s research was never simply scholarly or neutral; but rather was characterized by a specific political position. Against recent interpretations that risk turning Foucault into a scholar, here then Foucault is re-presented as a key figure for jurisprudential and political-philosophical research. Sandro Chignola, Ph.D, is Full Professor of Political Philosophy at the University of Padua (Italy), where he teaches History of Political Philosophy and Political Philosophy, and Visiting Professor at the UNSAM (Buenos Aires).